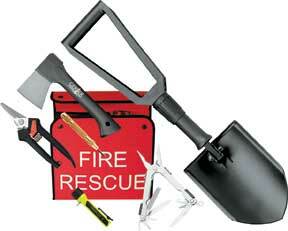 Gerber Fire Rescue Survival Kit. Includes one MP-600 model Multi-Plier, Back Paxe Axe, Folding Spade, Rescue Shears, Sports Saw, Window Punch, and a Streamlight 3C cell flashlight. All store in a compact red nylon case.